The students were inspired by the Royal Wedding for their Sunday Selfies. It showed them that even American kitties with mixed heritage can find their prince or princess for a happily-ever-after. 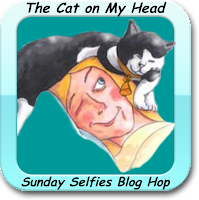 We are joining our friends from The Cat on My Head for their weekly Sunday Selfie Blog Hop. Please hop on over to view the other entries. OOH MYY how regal you'll are :-) I LOVE the royal costume too! Oh my word! So many fine princesses and princess, each and every one has a happy and welcoming kingdom awaiting them! I think the girls clearly know what to look for when it comes to sparkly things, diamonds after all, are a kittens best friend ! OMC! Cuteness overload! Your mom gets the BEST photos! Could they be any cuter??? You are way cuter than those royal toddlers. You babies are royally adorable! Awww... Those are THE BEST Royal Pictures, EVER. PURRS. Such a sweet royal family.